I don't much care for hip-hop, disco-fusion music, which is how I hear the music of Lady Gaga. That's fine. You like Lady Gaga --enjoy! 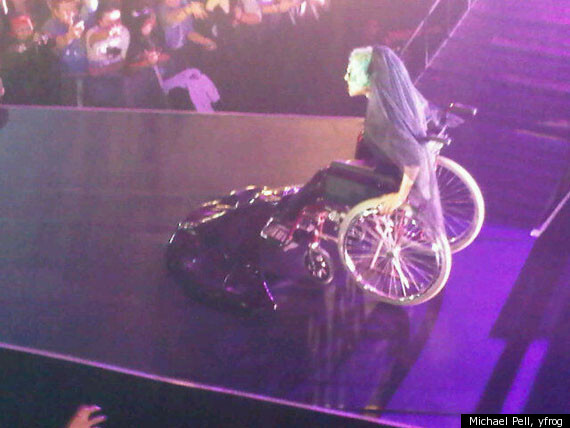 But Lady Gaga created a "much ado about nothing" storm recently when during her performace she appeared on stage using a wheelchair as a prop. Some were outraged. Some were supportive. Some, like me, did not worry too much about it. In my world, my wheelchair is no different from my prescriptive lens glasses. To get upset about the Lady Gaga using a wheelchair would be the same as getting upset about Elton John wearing outlandish glasses. Of course, disability access advocates have discussed it in Tweeterville and the blogosphere. And Bette Midler has moaned about it being a rip-off of one of her early acts. Personally, I am a couple of generations too far down the road to care much. I realize intellectually that a performer like Lady Gaga has an influence on people 15-25-years of age. And if I were conversant with the psychology of masses, I might be worried if the use of the wheelchair was viewed negatively. The one thing I do know, however, is that she doesn't have influence on the people who deny access and employment to people with disabilities. Oddly, I think there was actually more discussion among disability advocates about Lady Ga-Ga's performance than there was about the David Brooks (New York Times) descriptive phrase "bag of skin." Perhaps that's because many of the most outspoken advocates are younger than I am. Someone suggested making use of the Lady Gaga affair in the media. But I see no way we can go running to the media saying, "It's cool that Ga-Ga used a wheelchair in her act." To me, the Brooks column (can anyone say euthanasia?) is more detrimental to the acceptance of people with disabilities into full roles in society disability than what rolled onto the stage in Australia. I appreciate Wesley J. Smith's comment, "We aren’t what we can do, but who we are."